That is the best clay park I have ever seen. I think on the next rainy day maybe you could make a water park. What a great idea to work together and make something that is much more than what one person could have made working alone. Very creative! Awesome park! 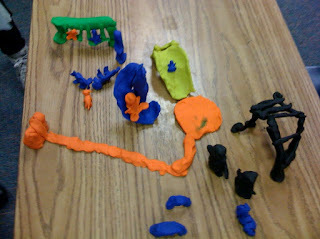 Jonah was telling me all about the park he made with James, Sean, Lexi, Alasia, and Taylor. I decided to go take a look. I loved the park! You guys did a great job. I think that it was a great idea to make a park out of clay. If you hadn't asked me if I wanted to make something with you this whole thing would not have happened. Thanks. Dear Lexi, Jonah, Alasia, and Taylor G., All the teamwork you put into to it was great. I loved all the colors you put into the clay park. Love,Shane F.